(CNN) -- It could be the ultimate test of human endurance: Three British explorers are risking their lives in subzero temperatures to measure the melting Arctic ice cap. 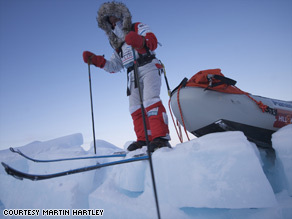 A member of the polar exploration team perches on skis inside the Arctic Circle. The team is on a three-month, 621-mile (1,000-kilometer) hike to their final destination at the North Pole. Along the way, taking precise measurements to determine exactly how fast the ice cap is disappearing. "It's extremely difficult to live out here. It's very, very easy to get cold injuries in seconds," said Martin Hartley, team photographer and filmmaker, via satellite phone. The team has been braving temperatures as low as minus 40 degrees Fahrenheit/Celsius spending their nights sleeping in tents and their days trudging across the shifting, barren polar expanse. The unique expedition was prompted by this chilling prospect: The Arctic ice cap is melting at an unprecedented rate, which may lead to a dramatic shift in average global temperatures. "In 2007, sea ice loss was the worst in recorded history," said oceanographer Kate Moran, professor of oceanography and ocean engineering at the University of Rhode Island. The last time that scientists can say confidently that the Arctic was free of summertime ice was 125,000 years ago, according to the Web site of the National Snow and Ice Data Center in Boulder, Colorado. All that could vanish within our lifetime, warn climate scientists, who predict that the Arctic sea ice in the summer season could be gone between 2013 and 2040. "The compasses don't work because we are so close to the north magnetic pole," said Hadow, director and head of surveying for the Catlin Arctic Survey. "When the sun goes down, we have to use other techniques to keep ourselves orienting north based on wind direction alone and reading snow drifts and using them as a guide," added Hadow. Current ice cap data are gathered by satellite and submarines, which can show the overall span of the Arctic ice melt, but these projections are not sufficient to provide an accurate estimate of its actual thickness. "There is no substitute for getting down on your hands and knees with a tape measure and drilling a hole and measuring the snow thickness, ice thickness and the free board where the water comes in up through that surface," Hadow said. The Arctic sea ice acts as a natural sunlight reflector, protecting the Earth from overheating. As the ice thins, more sunlight passes through, further warming the ocean and accelerating the effects of climate change. This feedback loop could have catastrophic consequences for people living in coastal areas and many animal species, according to the Intergovernmental Panel on Climate Change, a United Nations governing body on climate change. The privately funded $4.3 million Catlin Arctic Survey is set to end in May. "We are not here just to make a journey to the North Pole. We've all done that. That's not the motivating force. How much information can we find out and deliver back to the wider world for its use?" Hadow asked. The scientific findings will be presented at the United Nations Climate Change Conference of Parties in Copenhagen, Denmark, in December. There, an international committee of scientists, heads of state and policymakers will gather to assess the Kyoto Protocol. The explorers are also tracking their journey on Facebook and keeping the public updated with daily Internet-based feeds on Twitter. "People ask me how I keep going. I don't know. I just have to, because if I don't keep going, it all falls apart," said Daniels, group navigator. "You just have to grit your teeth and remember why you are out here and get on with it."